After declaring famine in parts of South Sudan earlier this year, swift aid operations have lifted the country out of its ‘famine status’, but this is no cause for celebration. “The situation has deteriorated. There are more areas where people are food insecure… It has not only deteriorated, but it’s getting worse faster than we expected.” – Deepmala Mahla, South Sudan country director at Mercy Corps. In February 2017, South Sudan declared two counties in Unity State to be in famine. There were widespread fears that famine would go on to sweep across northeast Nigeria, Somalia and Yemen, causing devastation, suffering and death. 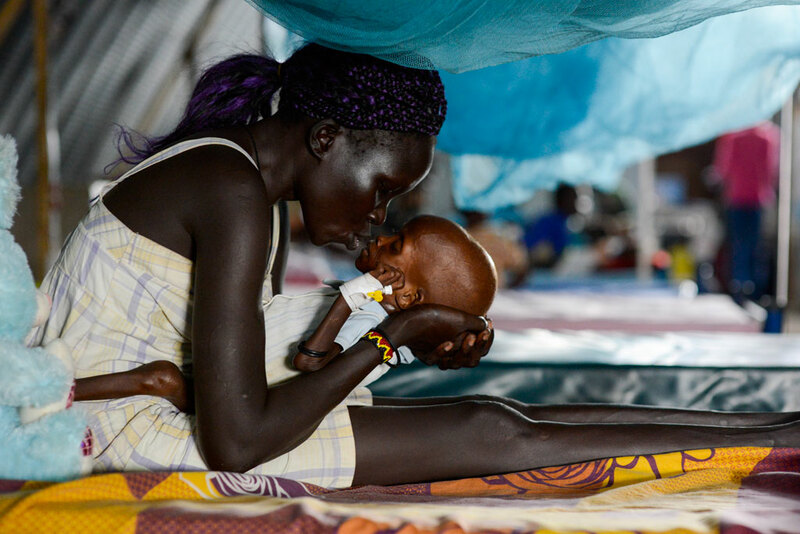 By June, however, South Sudan declared that the disaster had been averted and the country was no longer in famine. That is not to say the situation has improved; the number of people at risk of starvation has increased by over 1 million. For as long as conflict and instability continue to wreak havoc across South Sudan, this man-made food crisis is not going away. The IPC is very clear that ‘famine is not a rhetorical, emotive term. Rather is is a scientific classification based on standards, evidence, and technical consequences.’ It is up to the analysts, governments and NGOs to use this information however they deem necessary to invoke action. This is crucial because in the case of South Sudan, the change of famine status does not mean the situation has much improved. In May 2017, the IPC estimated 5.5 million people (45% of the population) were ‘severely food insecure’. Across June, July and August, after the famine status was revoked, this number reached 6 million people (50% of the population), becoming ‘the greatest number of people ever to experience food insecurity in South Sudan’. At the time of writing, 1.7 million people require immediate assistance. The first ‘famine’ classification since Somalia in 2011 prompted swift large-scale action which averted further deaths – UN Secretary General Antonio Guterres said it was thanks to donors responding quickly to his warnings in February and his appeal for $4.4 billion in aid money to fight the famine and hunger crisis (70% of this money was raised) that this catastrophe was averted. The classification of ‘severe food insecurity’ does not have the same emotive or political connotations as ‘famine’ but the scale of South Sudan’s food crisis should be treated with equal vigilance, particularly given the factors at play in the continuation of this crisis. The Uruguayan representative to the UN Security Council, Elbio Rosselli, highlighted at the recent meeting serious concerns about the ‘lessening sensitivity of people’ towards humanitarian suffering particularly due to the overuse of ‘euphemisms’ such as ‘food insecurity’ when discussing world hunger. The concept of food security does have its place and is a broad term under which the IPC Phase Classification exists, but Rosselli made a useful observation about how these terms affect how emotively the international community responds to food crises. 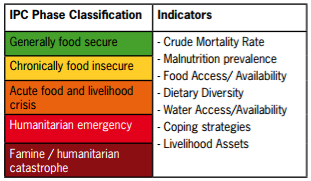 The IPC is a classification system for food crises based on a range of livelihood needs. See www.ipcinfo.org for more information. The crisis in has been hailed as a ‘man-made’ famine – years of fighting and civil war have disrupted agriculture and crop production, farmers have lost their livestock, urban populations have been unable to cope with the rising cost of food, and people have, in general, been ‘pushed over the edge of survival, leaving many families with nothing but leaves and roots to eat’. The World Food Programme (WFP) warned ‘that there is only so much that humanitarian assistance can achieve in the absence of meaningful peace and security.’ Some commentators have therefore called this famine ‘government-made’ due to the attacks on civilian populations and the government in particular attacking areas of high agricultural production. The refusal of all combatants to abide by ceasefire agreements and take productive and decisive measures towards peace has displaced millions of people and disrupted food production which has led to hyperinflation. 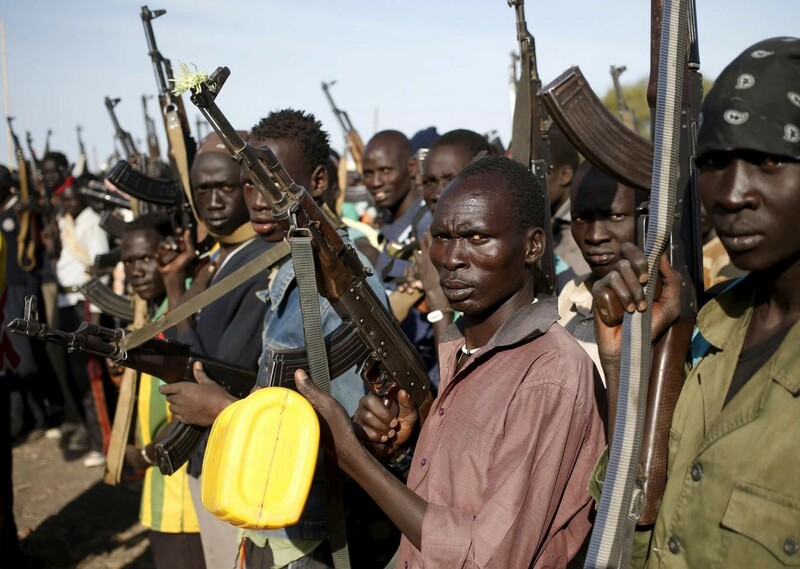 Furthermore, the South Sudanese government, as well as some opposition groups, have been blocking vital humanitarian aid to a number of regions including Wau Shiluk and Kajo-Keji County of Yei River State, and UNMISS officials have accused the government of being overly bureaucratic in granting visas to additional peacekeepers. Tackling the root causes of the food crises that are spreading across the conflict-ridden South Sudan, Nigeria, Somalia and Yemen looks to be the only route to ending widespread hunger, and the international community needs to increase efforts to ‘end violence, ensure humanitarian assistance and foster long-term development’. All speakers at the UN Security Council earlier in October agreed that there is a clear link between hunger and conflict. 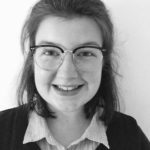 This blog has been written to raise awareness for World Food Day, a campaign established by the Food and Agricultural Organization of the United Nations (FAO). The theme of this year’s campaign is “change the future of migration – invest in food security and rural development”. The FAO has framed the discussion this year around ‘hunger, poverty, and an increase in extreme weather events linked to climate change’ as ‘important factors contributing to the migration challenge’ along with ‘increased conflict and political instability’. The challenges of food, conflict and migration have become almost inseparable in areas such as South Sudan and its neighbours where the complex intersection of challenges are a call for global action.